Luis Suárez has now scored in every major competition for Barça. After getting 56 in La Liga, 15 in the Champions League, 7 in the Copa del Rey, 5 in the Clubs World Cup and one in the European Super Cup, all he was missing was the Spanish Super Cup … until tonight. The Uruguayan has also scored the first official FCB goal of the season, Last year it was Leo Messi who started things off, also against Sevilla. Luis Enrique had never won away to Sevilla as Barça manager before. The league visits to the Pizjuán ended 2-2 and 2-1 to the home side. 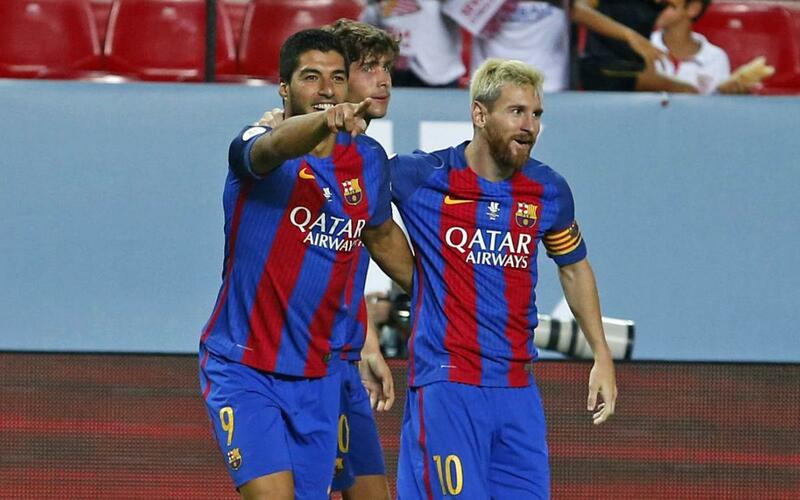 FC Barcelona had not won a Spanish Super Cup first leg since beating Real Madrid 3-2 at the Camp Nou in 2012. Since then, they had drawn at Atlético and lost in Bilbao. Eight of the starters on Sunday also started Barça’s first game last season. Bravo, Sergi Roberto and Arda Turan were the only newcomers in place of Ter Stegen, Alves and Rafinha. The game in Seville also marked the official debuts of both Lucas Digne and Denis Suárez. 2-0 was also the score when the sides last met, albeit after extra time, in the Copa del Rey final in Madrid, That was also the score the last time Barça played in Seville, although that was against the city’s other top flight club, Betis.